Thanks for landing here with us, in this space and in this time. Tapalou Guilds is a smattering of plants and creatures nested in a beautiful valley in Guilford, Vermont. While the actual farm is made up of thousands of plants all interacting and existing in their unique language, the people here are Hanna Jenkins and Andy Loughney. We came to farming via the scenic route, taking quite a few pit stops along the way as we explored what our deepest passions were/are and where we felt our efforts, intellect, sweat and hearts could grow the most strong. Hanna and Andy started Tapalou Guilds in 2015. The farm’s namesake is from pet names. Hanna’s dog Chispa was nicknamed “Tapfoot” and Andy’s dog, Penny was nicknamed, “Lou”. They liked the ring of Tapalou and it seems fitting given the rhythm of farm life. Hanna grew up in the Northeast Kingdom in Northern Vermont. She left for a few years to see what medium she would best grow in. She spent a stint serving in the Peace Corps in Honduras. When she returned a bit tattered and wild eyed she moved to Philadelphia where she worked as an advocate for survivors of domestic violence. This is where she met Andy and it was love at first sight. They decided to move to Vermont to see if maybe a more rural life would provide better for their individual and collective roots. Hanna pursued jobs in the non-profit sector, serving families and becoming active in issues of expanding access to local food for everyone in her community. Hanna started growing flowers more seriously once she realized the joy and calling she had to be surrounded by as many flowers as possible. Hanna has a deeply spiritual relationship with flowers, with them serving as her guide in her efforts of expansion, mindfulness and resiliency in the face of challenge, grief and being alive. When not in the field Hanna is most in love with creating art, cooking, laughter, family, friends, traveling and dogs. Andy caught the farming bug in 2007 while working as an educator at The Lands at Hillside Farms in Shavertown, PA, near where he grew up. His experience on this non-profit dairy farm provided new insights into food production and land management and instilled in him a greater reverence for the outdoors and natural processes. Andy met Hanna in 2009 and they moved to an off-grid cabin in southern Vermont the following year to explore their dreams of homesteading and living off of the land. 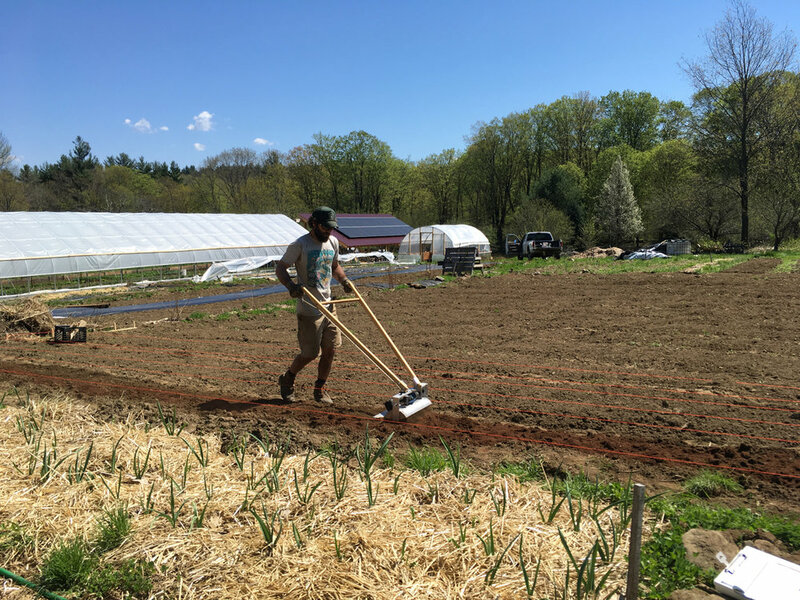 Andy received a Permaculture Design Certificate in 2012 and also worked as the coordinator for Windham Farm & Food, a local food aggregation and distribution service. In 2015, Andy and Hanna had the opportunity to purchase an old farmhouse in Guilford with an adjoining five-acre field and jumped at the chance to push their vision in different ways. Since then, Andy has planted hundreds of perennials that will ultimately mature into a food forest on the northern side of the field. Andy currently focuses the majority of his attention on hemp for CBD production and his business associated with that, but can also be found doing various infrastructure improvements on the farm, broadforking the no-till vegetable beds, and looking to nature for insights and guidance in a busy world. He enjoys spending time with his family, playing and listening to music, reading, and constantly questioning. He aims to be a productive citizen of Earth and feels grateful to be here.